Full Storify of the tweets here. 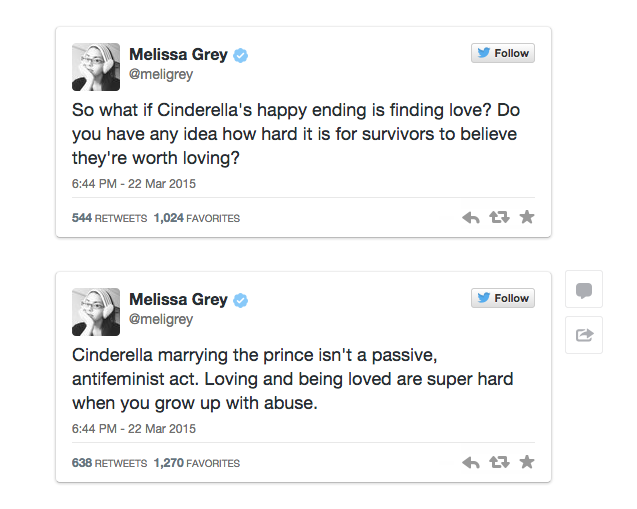 My Twitter feed was all abuzz yesterday after young adult author Melissa Grey (@meligrey) posted a series of tweets about re-imagining the classic story of Cinderella as the triumph of a child abuse survivor. She challenged the idea that the story is "antifeminist dreck," all about a woman who "waited around" for her prince (a man, naturally) to rescue her. Instead, she sees Cinderella as a woman who overcame impossible circumstances to find her own happiness. Sure, it might be the old trope of "finding love," but as Grey says, "Do you have any idea how hard it is for survivors to believe they're worth loving?" As someone who grew up in an unstable home and went on to have an awful first romantic and sexual relationship, Grey's tweets really hit home for me. To say that a person is simply letting his or her family treat them a certain way is invalidating the fear and feelings of powerlessness experienced by those who suffer from abuse. This holds especially true when you're talking about children being mistreated by their families. When your fundamental model of what loving and caring for another person looks like is warped, is it any surprise that you may go on to have trouble with relationships later in life? Maintaining a supportive, loving relationship—romantic, platonic, or otherwise—is an enormous achievement. Sure, this analogy isn't perfect. We don't find out how happy Cinderella's "ever after" really is, falling in insta-love might not be the best strategy for cultivating an enduring, healthy romance, and, as my boyfriend pointed out, Prince Charming definitely gets cast more as "the rescuer" than "the partner." I still think that Grey gives us plenty of food for thought. Source: This article from The Artifice. To switch gears here, I want to address Grey's refutation of the idea that seeking love is inherently antifeminist. I always find it hard to put my thoughts into words about questions like these, but I'll try my best. It's true that our literary tradition is full of women who see marriage or romance as the key to everlasting happiness, and this indeed is a woefully limiting message for girls and young women to hear. But does this mean that a woman who sees a romantic relationship as a worthwhile component of a happy life is automatically "part of the problem," or somehow not worth talking about? Ana of Things Mean A Lot has a favorite motto when it comes to writing about women: all the stories, please. I take this to mean stories about women seeking love, stories about women not seeking love, and stories about women that have nothing to do with love at all. The idea that a woman's life (or story, as it were) is only meaningful if she's shattering stereotypes strikes me as extremely antifeminist. Women (like men, like all people) are multifaceted, and just because one aspect of a woman's life strikes you as "cliché" doesn't invalidate her worth as a human being. Still, this does raise a very important question: how do we successfully get the message across that whatever makes a woman happy is worthwhile without unintentionally reinforcing harmful tropes? What do you think of Cinderella being recast as a "survivor story"? Do you have any favorite stories of abuse or trauma survivors? Do you want to argue with me about feminism? Let's chat! I'd never thought about 'Cinderella' from this angle before, but as they say "if the shoe fits" (which works because of Cinderella and the whole glass slipper thing). I grew up watching the old Disney films and even today I'll happily sit and watch those over the new ones with all the fancy computer stuff ('Toy Story' is my only exception), and I turned out alright. I've become increasingly irritated of late with people saying that they reinforce ideas of a woman not being complete until she has a man. But has anybody ever looked at from the perspective of the man, and looked at his life before he meets the woman? In each movie there is an imbalance in the life of the prince/suitor, something that is making him unhappy: Prince Charming in 'Cinderella' is being hounded by his father to marry (not the best example of my argument, I know), Prince Phillip in 'Sleeping Beauty' becomes a hero to save Princess Aurora, Shang in 'Mulan' is quite arrogant and insensitive before meeting her, Belle saves the life of The Beast, Flynn Ryder doesn't care about anything but money before meeting Rapunzel ... I could go on forever. In each of these cases, meeting this woman makes the prince and his life better. Yes there's always love at the end, but their kids movies - what do people expect? A 'Romeo & Juliet' type ending? I think the better lesson to take from these is that being kind and compassionate to those around you makes their lives better, regardless of who that person is - even if it's just a bunch of talking mice in your house. I really love this: "The idea that a woman's life (or story, as it were) is only meaningful if she's shattering stereotypes strikes me as extremely antifeminist." It's so true. All our stories are meaningful. For me, the Cinderella story has never actually been about romance. It's the tale of the underdog that really tugs at me. Overcoming the odds, triumphing over all those obstacles. Against all odds. That's what appeals to me. The slipper that fits is the story of that triumph. "How do we successfully get the message across that whatever makes a woman happy is worthwhile without unintentionally reinforcing harmful tropes?" More diversity of stories? We all agree that the icky thing about old Disney movies is that the majority of them end up in marriage, so the solution is not to erase those stories but to increase the number of stories in which the heroine rejects or doesn't even come across that path. The reason most of us readers can remember fondly films like Cinderella or Little Mermaid and think we weren't touched by its politics is because we had access to other stories as well. That's not necessarily true for people that didn't have or wasn't interested in books. I vote for more movies like Brave, which has a weirdly forced plot about a princess who doesn't want to marry because marriage will take away her freedom (? ), but is actually about her relationship with her mother, and it was the BEST. But I will keep watching the Little Mermaid 'til the end of times, so I agree wholeheartedly with Ana. All the stories, please! That's a very interesting point about taking a look at these stories from the men's perspective. I feel like (at least in this genre of storytelling) we rarely get a tale from the prince's POV! I think you're totally right about the main message, and that's something that Melissa Grey tweeted about Cinderella. Ultimately, she saw being kind as Cinderella breaking the cycle of her abuse. I'm all about that! Cinderella has always been my favorite princess, but I have always been looked down on for liking her. All of the other little girls loved Mulan, Belle, and Jasmine, because, according to them, they actually did something. Apparently, endlessly completing the tiresome work that your stepmother forces on you does not count as "something." I think Cinderella might be one of the strongest princesses. She inspired the whole "rags to riches" idea that someone who had been mistreated could actually make something of their lives. I know all too well how hard it is to accomplish anything when everyone else, including your family, does not believe in your, or worse, abuses you. Cinderella was strong enough to put her past behind her and find happiness and love in her life. We all know that finding love can be one of the hardest things about living. YES! This is exactly why I have never bashed books like the Twilight series. While it's true that I prefer stories in which the female character at least has some agency, I would have found comfort in a book like Twilight when I was a teenager. Bella is the type of character that I could have related to at that time in my life. It's good to have role models and something to aspire to, but it's equally as good to have the flawed characters that make you realize you're not the only one, you're not alone, and few people in this world start out with self-confidence and a high level of self-esteem. I have to admit, I was definitely a Mulan fan girl because I thought she was such a BAMF, but I see your point. And yes, so agreed that its a sign of strength to be able to move past abuse and that love can be a struggle to find! With you on The Little Mermaid. No shame. I agree that it's about creating a richer diversity of stories instead of erasing the more stereotypical ones. It seems like the conversation can sometimes devolve into "x is better than y and therefore everyone should do x," when I think we really need to be saying, "there's x, y, and z, and you should do whatever works best for you."